I recently returned from more than a week of hiking in Yellowstone National Park and all I can say is WOW! We hiked over seventy miles, but enjoyed every hard-earned inch. We are so lucky to live in a country that has such natural beauty in abundance. 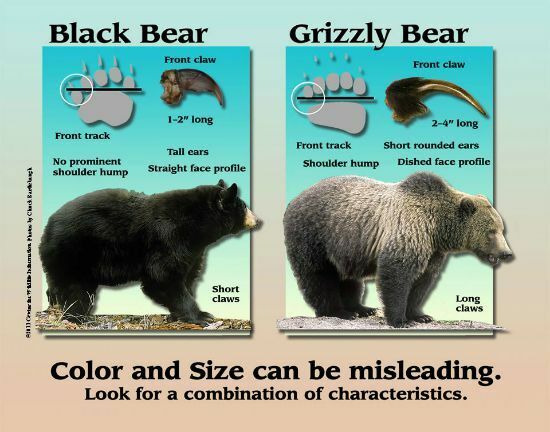 Whenever I explain to other people that I hiked in Yellowstone one of the first topics to be raised is bears. 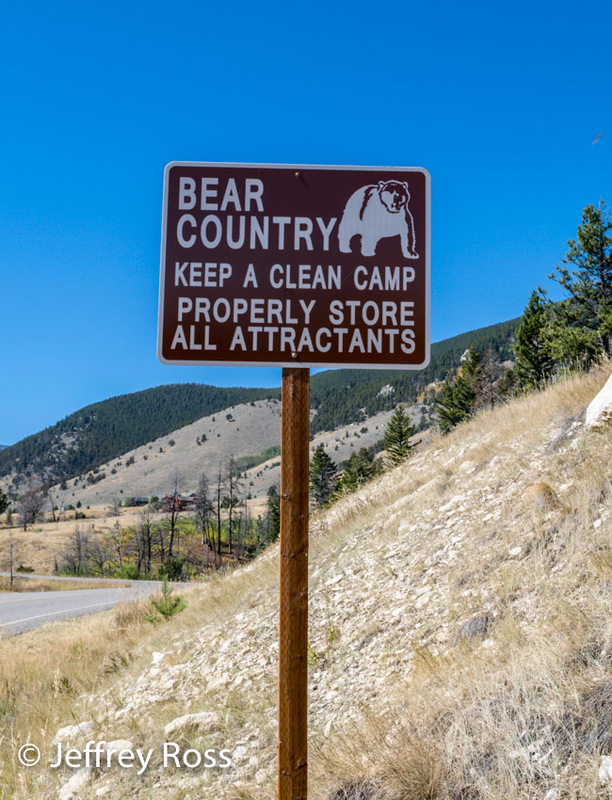 Yes, Yellowstone has bears and by reading all the literature, posted warnings and sales pitches for bear spray one would think they were lurking around every corner. I am not making light of visiting areas in bear country. 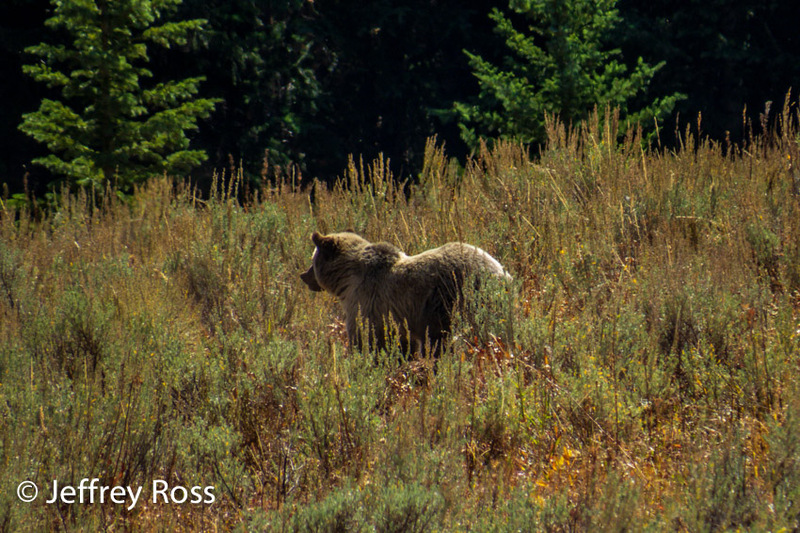 It needs to be a real concern and we did take it seriously, but not everyone sees the bears of Yellowstone when they visit the park. All the hype does make one a bit paranoid, but I am not sure that is a bad thing. According to the National Park Service, over 100 million people have visited Yellowstone since 1980. During that time 38 people were injured by grizzly bears. 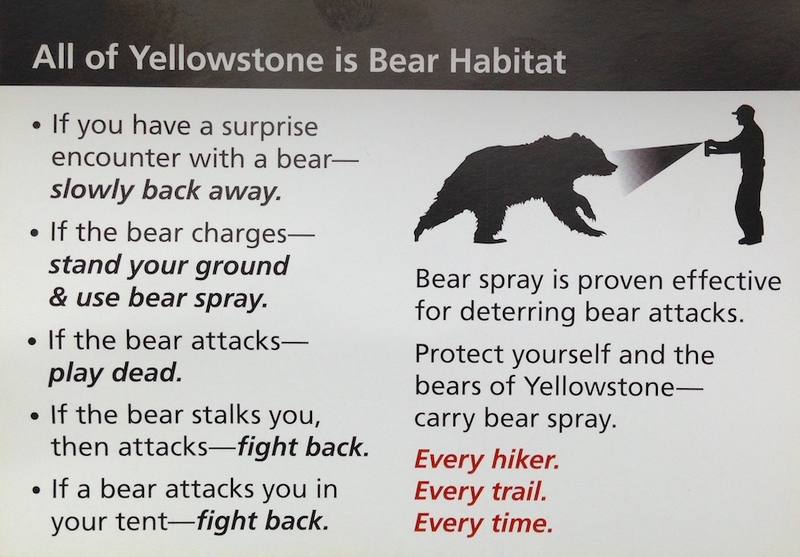 Also noted is that only eight people have been killed by bears in Yellowstone since 1872. To keep things in perspective, the website reminds visitors that more people have died from drowning, burns, etc. 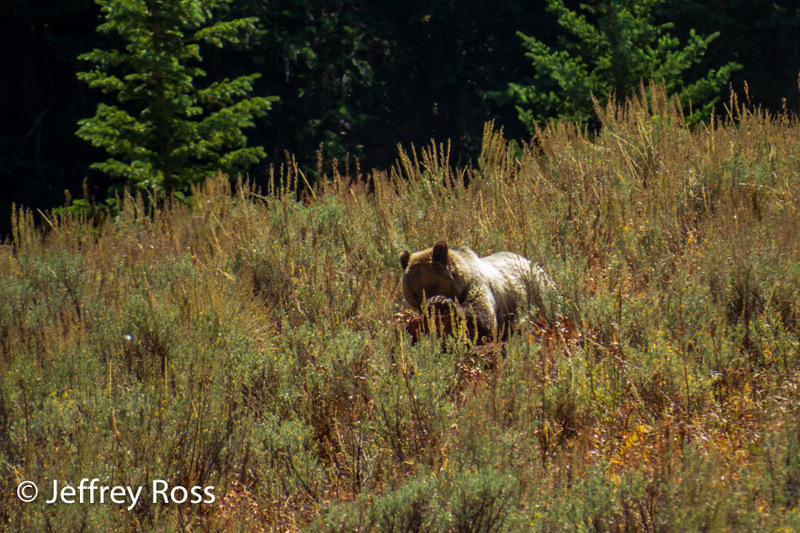 We had two grizzly bear encounters in and near Yellowstone National Park. We were hiking along one of the paths around Ice Lake in Yellowstone returning to the parking area. 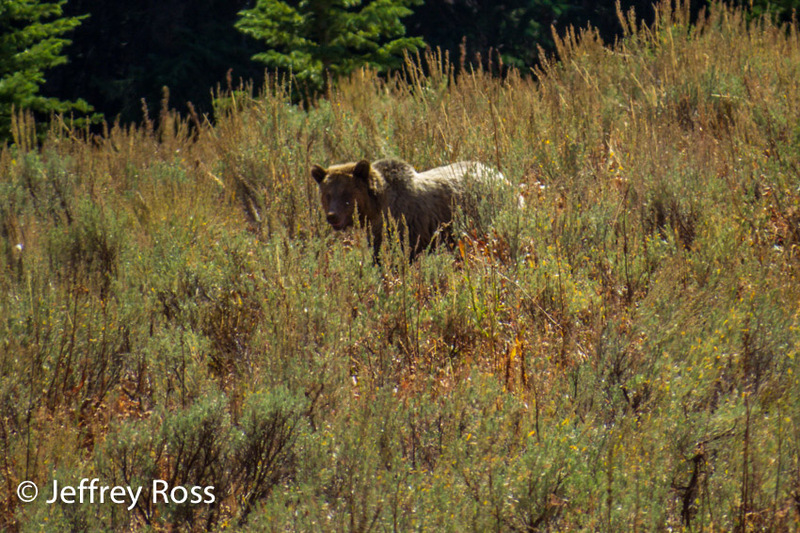 Three hikers were hiking towards us and as they passed, they explained that a mother grizzly crossed in front of them with two adolescent cubs and they were going to hike around the lake to get back to their car. This was a significant, lengthy detour part of which was uphill along the roadway. All the literature I read indicated that the chances of being attacked in a group of three or more was only two percent. 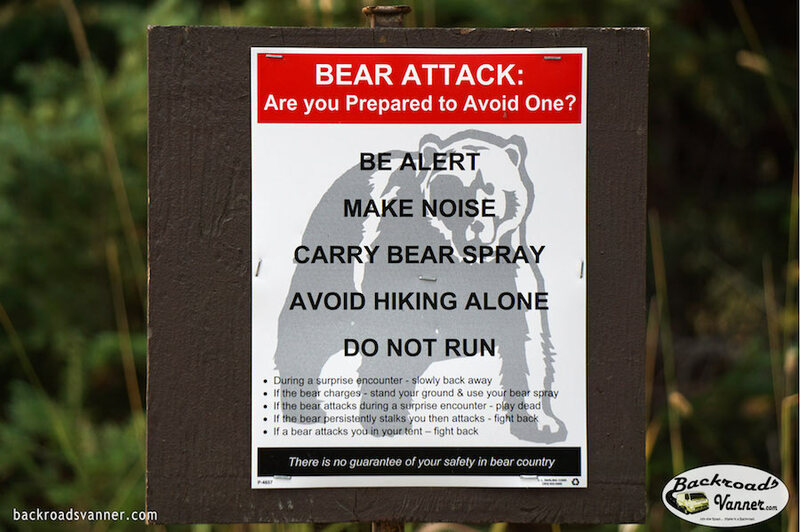 I suggested to the group that we continue heading back toward the parking lot and risk a bear encounter since we were a larger group and had several canisters of bear spray between us. We walked quickly, but deliberately toward the area near the road where the bears were spotted. We noted their tracks along the path. Apparently they didn’t like the debris in the wooded area any more than we did and they were walking along the relatively clear hiking path. About one quarter mile from our cars, the three bears (not those three) were spotted about 300 feet ahead of us. The mother bear (very large!) stood up on her hind legs and spread her arms wide in an “it was this big” fashion. I estimate that she stood at least nine feet tall at that point. One of the rather large cubs also stood in the same fashion while the other remained on all fours looking our way. The bears were only there for a half-minute or so when they scampered into the woods. It was very exciting indeed, but we were glad that we did not have a more intimate bear encounter. We made it to the cars without further ado. My only regret was that the action happened so fast I couldn’t get a picture. 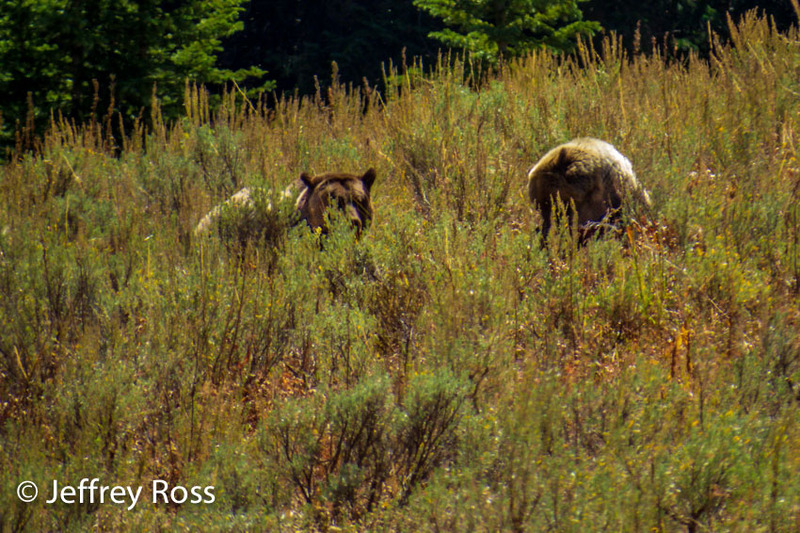 Our second sighting a few days later was of a grizzly with three cubs along the Beartooth Highway near Beartooth Lake. We noticed a group of people along the side of the road, a certain giveaway that something interesting was happening, and we pulled over. Sure enough, there was a group of three Grizzly bears about 450 feet downhill munching on a carcass that I assume was that of an elk. 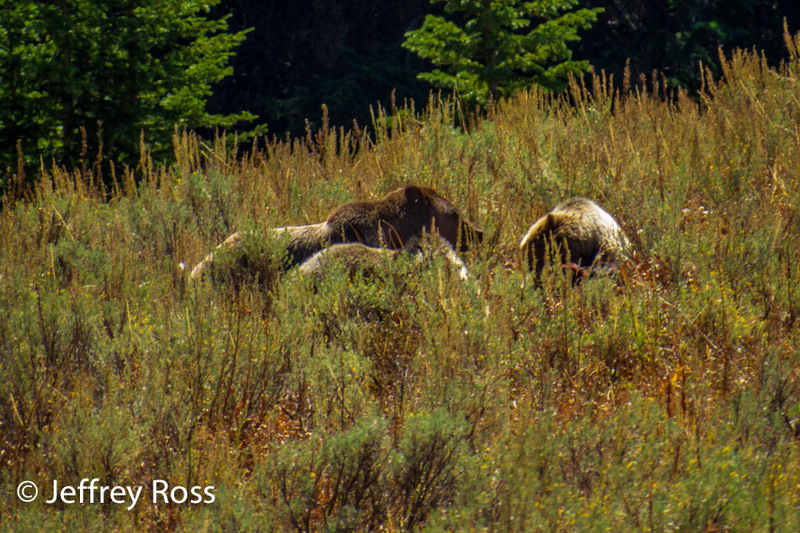 The speculation was that this was a mother with her cubs, but the bears all looked to be similarly sized…so who knows? The bears were more interested in eating than in what we were doing and since we were a lineup of more than a dozen people standing quite a bit away uphill, it was not a tense encounter. Bears are large and they look fat, but don’t ever think you can outrun one and don’t for one minute think climbing up a tree is going to help. 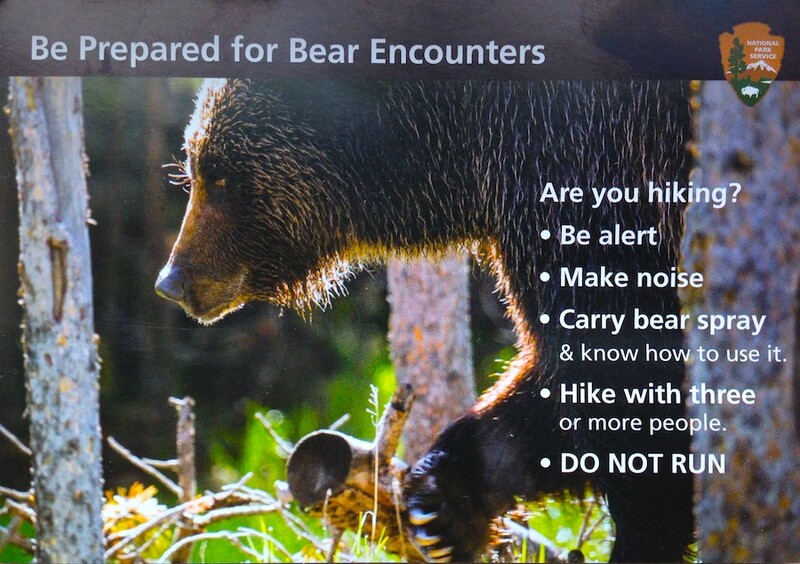 Read the placards above to see how to survive a bear encounter. I am an enthusiastic amateur photographer. I enjoy wildlife, but I don’t have an expensive wildlife kit. The closest I come is my Canon SX50HS bridge camera that has a telephoto lens of approximately 600mm of reach. This isn’t the highest quality camera or lens, but I think you can get an idea of what we saw at the bear buffet along the Beartooth Highway. After leaving Yellowstone, we stayed in Red Lodge, Montana one night and did some hiking along the Silver Run Plateau, Trail # 102, Loop #3 in the Custer Gallatin National Forest. There were warnings there as well. There’s a reason for all these signs. One shouldn’t be afraid, but it is important to take precautions and be aware. They refer to it as being “Bear Aware” and they aren’t kidding. 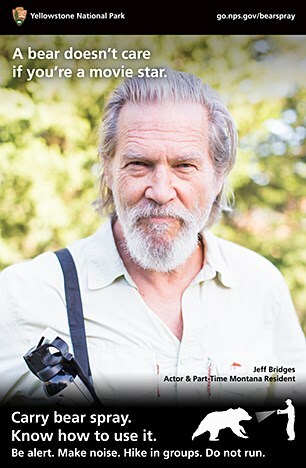 Yellowstone even uses celebrities to help impress the importance of bear safety upon visitors. We now have bear encounter memories that will last forever and we are very happy that they turned out the way they did.